Info: *On April 17, ICT released a 45-second film clip that was shot and sent into exile at great risk to those involved. The clip can be viewed here. 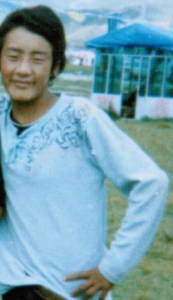 According to exiled Tibetan sources, at around 1:30 pm he doused himself in petrol and set himself on fire. He walked into the street calling for the long life of the Dalai Lama and for freedom in Tibet, according to the same sources. Police began to kick and beat him with clubs spiked with nails rather than immediately focusing on putting out the flames. According to two Kirti monks in Dharamsala, India, who have spoken to several individuals in the area: "Unable to bear this sight, local Tibetans on the scene stood up to the armed security personnel without regard for their own lives, and shouting that the body should be handed over to them, tried their best to block their path as they tried to take him away." Losang Jamyang died after his self-immolation but reports about the time of his death differ. He was taken away by police, and one of the most reliable reports suggest that he may have survived until Monday (January 16) when he died. Losang Jamyang became a monk at the local Andu monastery (of the Gelugpa school of Tibetan Buddhism) as a child, but later joined a primary school (Bontse school) in Ngaba county and completed his education there. In 2011 he was a leading member of a popular association for the promotion of Tibetan language in his village, and as a result had faced pressure from the local authorities.